Infine-e-Station modular plate systems are designed for front loading installation using Hubbell's Xcelerator jack series and a comprehensive offering of audio, video and fiber Snap Fit connectors in single and double gang applications, delivering network convergence to your work area. The Infin-e-Station modular plate series provides you with the flexibility to address your specific requirements. This series accepts any modules in 3 unit combination for single-gang; and 6 unit combination for double-gang applications. 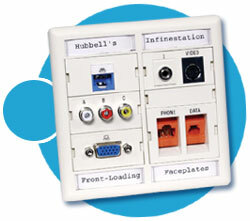 Click here to view Hubbell's Infin-e-Station Modular Face Plates (Front-Loading) PDF.